A friend of mine called me the other day. He’s a high-end kitchen equipment and food distributor. He had just received a supply of Beluga caviar and was selling it for S$6,000 a kilo, with a minimum order of 100g. “Would I be interested in some?” he wanted to know. Of course, my answer was “no”. Not that I wouldn’t have loved to have had some. But there was no way I was going to shell out that much money. Fortunately for those of us with cravings for a little caviar but who aren’t willing to mortgage our homes for such occasional gustatory indulgences, there are some substitutes on the market. The best I’ve tasted to date is Avruga, a Spanish mock-caviar made from herring roe. It’s become increasingly popular, both in restaurants and among greedy gourmets, for several reasons. For one thing, it’s cheaper. Much cheaper. Around 10 times cheaper. But it also tastes good. And while it doesn’t exactly replicate the flavors of top-grade caviar, it has a nice subtle taste. It’s also not as salty as real caviar. Since Avruga is affordable, it means being able to serve dishes that would normally be extravagant on a regular basis. For me, that means a breakfast of scrambled eggs topped with deliciously savory black pearls. I’m a big fan of this classic combination. It’s perfect for a slightly fancy weekend brunch and equally magnificent served small as an amuse-bouche at dinner. Of course, the scrambled eggs have to be made properly as well. They have to be fluffy, rich and not at all over-cooked. They also have to be made with a healthy amount of cream and butter, which means that while they won’t be healthy, they’ll be quite lusciously delicious. And made even more so topped with the Avruga. Whisk the eggs, cream and salt in a bowl. Melt the butter in a non-stick frying pan over medium-high heat. When all the butter is melted and bubbling, pour in the egg mixture. Wait 20-30 seconds and then lower the heat to the lowest setting. With a wooden spoon, stir the egg mixture continuously until just barely set. Then turn off the heat, toss in the chives, and mix them in evenly. Spoon the eggs onto plates, bowls or small shot glasses and top each portion with some of the Avruga. Wow. That´s some truly decadent looking brunch material. looks yummy! can i find out where i can get Avruga in singapore? thanks in advance! Eggy: Seems to be working now. Just in case, I reloaded the picture on my hosting site. Jane: Hiya, I bought some recently at Carrefour. They had it at the deli counter. Wow, looks wonderful and delicious! thanks for your tips on scrambled egg, now I know the trick is in the whisk – will try it sometime. Is that the same thing that Iggy’s used in his fish maw and vegetable nage? What happened to your Asia Pacific Best Restaurants list? wow, I love the little glass that you have the eggs and Avruga in. Looks so heavenly that it’s about to fly away with thoe wings. L: Thanks also. It tastes like heaven too. Oyster: It’s actually not too difficult. Are you using a non-stick pan? Also, be gentle when cracking the egg into the pan. Some suggest cracking the egg into a small bowl first and then tipping that into your pan. Pineapplemalibu: Yup. There are quite a few yummy avruga dishes at Iggy’s. Anon: Hi, yah, I know I’ve been a bit behind on this. Truth is I’ve still compiling, plus some people are still emailing nominations. So, I’ll probably get this up mid-to-end July. Cin: Thanks. I bought these gorgeous little shot glasses from a great design shop in Sydney. Sturgeons are an endangered species and the US has banned the sale of beluga caviar. So other than the exorbitant price, perhaps you shld consider this as the main reason why u shldn’t buy that caviar. DBrane: The city of Chicago in the USA has also banned the sale of foie gras. Thankfully, the rest of that country nor the world has followed suit. Your point is noted. 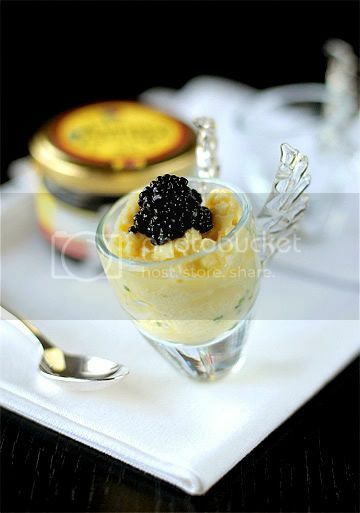 In many ways, the restrictions on new exports has caused the prices of existing stocks of caviar to skyrocket. Right now, only Iranian caviar exports are “legal”, as stipulated by the United Nations. Hopefully, Russia and the other Caspian Sea-bordered nations will be able to comply to regulations and the restrictions will be lifted. There’s also some interesting research going on the see if the Caspian sturgeon population can be replenished. Anyway, I’m pretty happy with Avruga for now. And even if more legal caviar becomes available, it will still probably be too expensive for me. Every year around July or August when I begin working on holiday campaigns I get to indulge in an insane amount of exquisite caviar. No one seems to want it after photography so it comes home with me, but the worst part is not having friends who appreciate it. Will you come visit Los Angeles and eat a few thousand dollars worth of this stuff with me? I promise to share. And there’s no better way I enjoy it than with eggs! I love how you have presented the little “amuse-buoche” in a winged cup… a flight to heaven with every mouthful! great receipe and good tip on the avruga. You may want to try Lumpfish cavier substitute- it has a stronger flavor than the avruga but is more subtle than Beluga. i was reading how there is a caviar specialist who will take one of the individual beads of avruga caviar and roll it around in his mouth to ascertain the exact amount of salt to be added to a singular batch. it’s such a delicate and interesting product. I was convinced I didn’t like caviar until a fortnight ago, when I had löjröm (bleak roe in English, I think, tiny orange-pink eggs) caviar at a wedding banquet in Sweden, and then in a restaurant back home in Estonia few months later. I had always found the proper caviar (easily available during the Soviet time:) way too salty and, well, fishy. I will definitely consider eating avruga, should I come across that any time soon. Thanks for the tip, Chubby Hubby! … sorry, should read ‘in Estonia few days later’. Oops! Where to buy Avruga as Carefour is closed??? I used to always pick it up at either Meidiya or Culina. Haven’t checked in a while if they still carry it.